Friday nights during Lent were enhanced at OLW this year and the growing participation suggests the new format will become the regular format in the future. 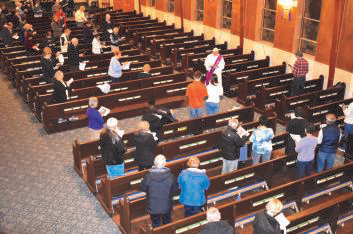 In 2018, OLW’s church was in the process of renovation during Lent and Stations of the Cross were not possible in the church. Stations were held in the Gathering Place and, although may parishioners participated, the atmosphere of “Stations” with a celebrant, either a priest or deacon was lacking. Instead, a video was shown in the Gathering Place with one of the deacons reading the prayers. While the concentrations was intent, the environment was not quite the same as the environment in the Church where 14 Stations of the Cross are positioned on the walls of the church, and have been since the church opened. This year, as Stations of the Cross returned to the church, (…and home-made soups also returned!…) OLW introduced a new service. Confessions have been heard in the “Bride’s Room”: during Stations of the Cross and a Mass has been celebrated immediately following Stations. OLW’s new associate pastor, Father Vinod Kumar Nagothu, has been hearing the confessions and celebrating the Mass, which seemed to be growing in attendance as Lent progressed, even with the lack of a major promotional effort.